From industrial loft-style kitchen to luxury three-season porch, these dream spaces are filled with inspiration. This industrial, loft-style kitchen by Past Basket, in Geneva and Milwaukee, combines everyday function with the unique architecture of the home. When Jamie Speaker and his family built their dream home in Cedarburg, Wis., a northern suburb of Milwaukee, they had their minds set on a specific style of kitchen. And spacious. The Speakers’ kitchen is 30 feet wide by 60 feet long, with cathedral ceilings, outer and inner islands, and stainless steel appliances. The Speakers teamed up with Kubala Washatko Architects in Cedarburg and Past Basket Design, in Geneva and Milwaukee, which is co-owned by Dave McFadden, wife Linda and son Dan. “Our objective on this project was to give proper definition to the kitchen space, blend into and complement the home’s architectural elements, create a work zone for everyday meal prep and accommodate large social functions,” says McFadden. The Speakers’ kitchen has many special features. A pantry with open shelves was made attractive with a hutch that disguises items on the open shelves. The outer island is 14 feet long, with seating for five and a counter overhang supported by custom steel posts that match the ceiling trusses. The inner island, which resembles a traditional farm table with table legs, includes refrigerator drawers and a prep sink. There were design challenges – especially the expansive windows that gave little opportunity for wall cabinets around the cleanup areas. This was solved by providing outer-island cabinetry for dishes, not far from the dishwasher. Lighting a kitchen with vaulted ceilings proved to be a challenge. Structural framework, resembling the ceiling trusses, secures the can lighting at the top of the upper cabinets. The Speakers’ kitchen is turning heads. The project recently won the 2014 National Kitchen and Bath Association award in the large kitchen category. McFadden and co-designer Debbie Larson traveled to Las Vegas to receive the award. “It’s pretty special to earn nationwide recognition,” says McFadden. 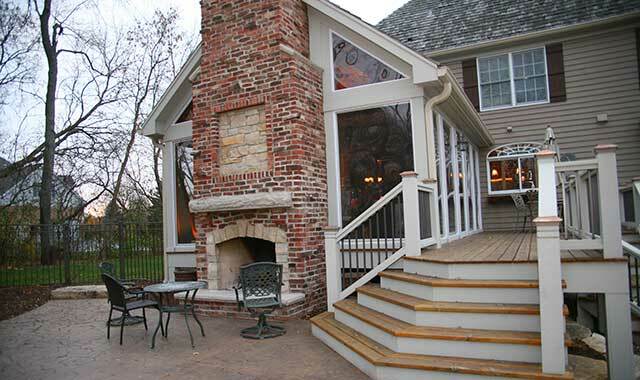 The unique two-level fireplace on this porch, designed by Korte Architecture in Crystal Lake, enables multiple family gatherings through three seasons. Tom Berg loves being outdoors. Whether it’s on a ski vacation or just relaxing at the Crystal Lake home he built 15 years ago, Berg, wife Lisa and their three boys prefer being outside every chance they get. That is, until bugs became a problem in their spacious tree-lined backyard. “The mosquitoes are brutal,” says the medical device sales manager. Two years ago, Berg decided to do something about it when he replaced his 16-foot-by-20-foot wooden deck with an 18-foot-by-22-foot three-season porch, which is located directly off the kitchen. “With three kids, we thought we could benefit from added space,” he says. The Bergs enlisted the help of Korte Architecture Inc., in Crystal Lake, owned by architects Brian and Andrea Korte. The firm has been in business since 2000 and has worked on a number of residential and commercial projects. The porch, accessible from the kitchen through French doors, has a rustic look that fits with the rest of the house. The trim work and structural beams are made of reclaimed barn wood that dates back to the 1850s, which Berg found through a barn wood dealer. In fact, he says you can still see the wood pegs and ax marks dug into the hand-hewn beams. The exposed vaulted ceiling and heavy timber beams round out the lodge look and feel. In addition, the room has removable window panels and no heating or cooling system, instead relying on a fireplace along the wall. Further down the wall, and located outside, is another fireplace. Stone accents in the masonry chimney are consistent with the rest of the house. “The fireplaces tie in well with the beams, since the fireplaces are Old World, with stone and brick,” says Berg. A vented gas grill sits in a back corner, providing a perfect setting for making burgers and brats without any worry about the weather. Filling out the room are oversized chairs, a loveseat and coffee table. After much consideration, the Bergs opted not to have a television on the porch, instead leaving the room for conversation. Outside, the Bergs enjoy the second fireplace on a concrete patio that flows down into their swimming pool. The patio also offers up a nice view of the woods at night, when the Bergs and guests are huddled around the fire. 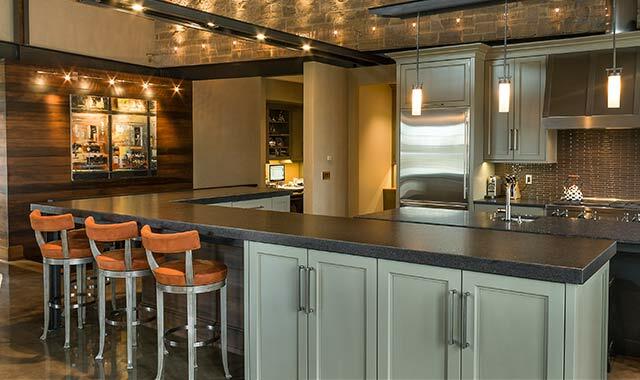 This warm and wide-open kitchen by Luv My Kitchen & Bath, in Crystal Lake, is illuminated by LED lights strategically placed above several work zones. The custom cherry cabinets, by Plantation Cabinetry, complement the solid Brazilian cherry flooring. Dana Frankowski has spent several years in the kitchen and bath remodeling business, transforming outdated spaces into inspiring, functional rooms. When he updated the kitchen in his Crystal Lake home two years ago, the designer and owner of Luv My Kitchen & Bath in Crystal Lake created an impressive showcase of custom features. The focal point of this wide-open kitchen is a spacious center island with a Picasso granite countertop. The island seats five and includes plenty of underneath storage with slow-close rollouts, a mixer storage unit and a lazy Susan. The island also includes a prep sink. The custom-built cherry cabinets by Plantation Cabinetry glow with a deep, cordovan luster that complements the warm, Brazilian cherry flooring. The kitchen also includes a cooktop built into the counter, a double oven and a double-bowl sink. Prior to renovations, Frankowski’s kitchen was small and closed in. But the new, more opened space contains wide walkways that allow a natural flow between the kitchen and the adjacent family room. The layout has maximized storage space. Frankowski also brightened up the new kitchen, illuminating the island with drop-down sconces and installing recessed lighting that lights up each of several custom work zones. When he renovated the main-floor bathroom, Frankowski stayed true to the original design of the home, even as he doubled the room’s size. He updated the lighting and installed a sleek travertine tile flooring. A small vanity was replaced with a contemporary bowl sink that sits atop a slate countertop. The contemporary bathroom is painted in a faux finish, and is accentuated by colorful wall art and accessories, including a large circular mirror. Between his new kitchen and bathroom, Frankowski has created two fully functional spaces that also reflect his family’s lifestyle and taste. This entry was posted on Wednesday, November 26th, 2014 at 11:59 am	and is filed under Home & Garden. You can follow any responses to this entry through the RSS 2.0 feed. Both comments and pings are currently closed.